The past week I’ve been living the German life. Residing in a not-so-small apartment in Dusseldorf, Germany, I’ve been hanging out with my sister, Patty who’s on her three week time off from the mines in Africa. Having an apartment as a base has been really nice, it’s given us a home away from home, having a kitchen to cook meals has saved a lot of money as well. We used AirBNB.com to find and book the flat. It’s been a pleasure, I’m glad a site like this exists. Flight to Copenhagen on a 787 Dreamliner – Norweigan Air, a low cost carrier (everything costs extra) – no service not even water or trash pickup. but the ticket was sure cheap! Arrive Copenhagen. Meet Patty in baggage claim. Easiest customs ever. Train, walk to hotel. Super cold outside. 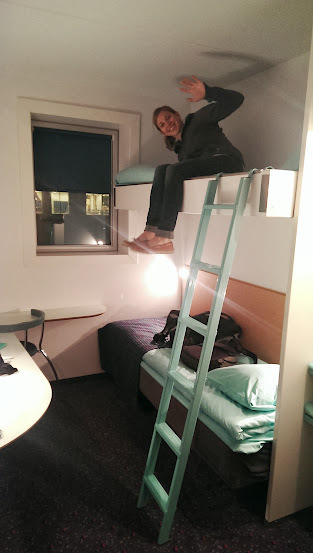 Tiny bunk bed room, the hotel reminded us of an Ikea. Made sandwiches for dinner in room. Visited museum, showed the history of Dusseldorf. Fun fact: 90% of Dusseldorf was destroyed during World War 2. Went for a run in Zoo Park, which used to be a zoo. Lot’s of people out! Giant Dom Cathedral! Walked around it, walked inside it, Holy cow this this is enormous! Climbed the 511 steps to the top of one of the spires, whew! Stopped for coffee and pastries. Super nice lady gave us free samples and free food. Overall we’ve found the Germans to be very friendly and always willing to speak English and smile. 1st castle: <enter name here>. Super foggy, lots of castle walls, felt like a fortress more than a castle. Had a feeling we got there way earlier than they opened and we got to walk around for free. On the way out, turn stiles were activated, etc. 4th castle, Eltz we were the only car in the parking lot. Took the 15 min trail walk to the castle, the whole time were saying, where’s the castle. After about 14 min of walking turned the corner and Boom there it was. I said Oh! And two people sitting on a bench next to us started laughing. Castle was very fairytale-ish. Lots of tower spires sticking out from the sides of the top, on the top of the hill in the center of a valley. Road trip home was very nice through tiny villages. Interesting story about running out of battery on my phone (using GPS) and Patty having to McGyver her phone with my sim card to restore navigation. 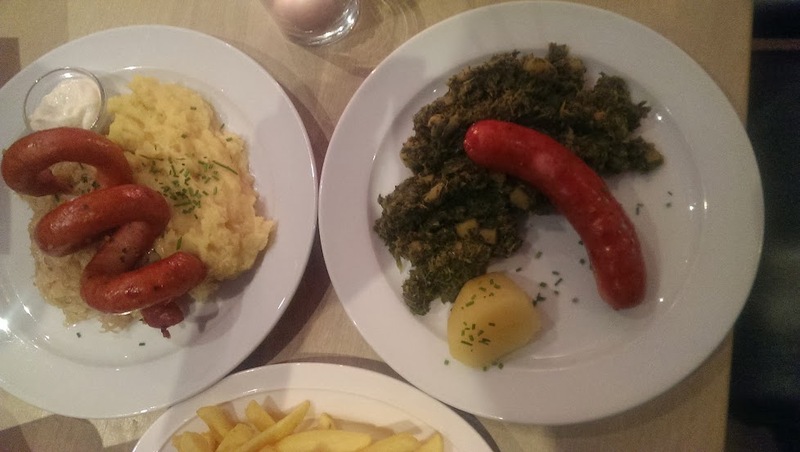 Had a traditional German dinner with sausages, sauerkraut and potatoes 5 ways! 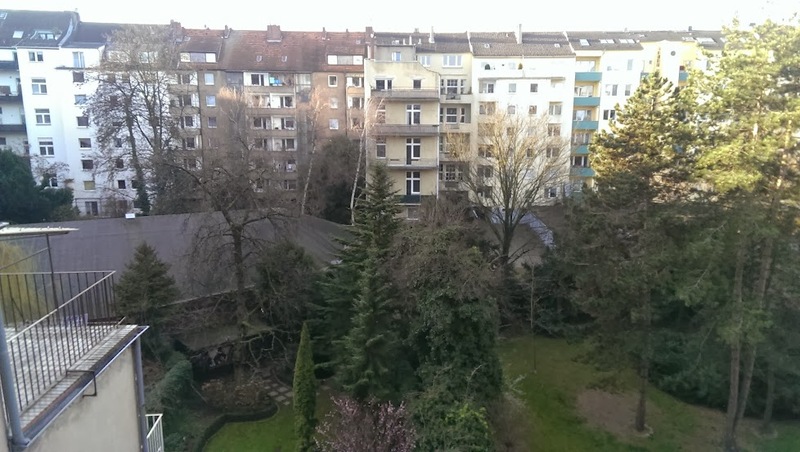 All of the buildings (and trees) in Dusseldorf were approximately the same height. Streets all looked the same. Drove wrong way down a 1 way street and even the lady who flashed us warning wrong way was very nice and smiled. Very efficient, doesn’t seem to be much waste in Germany as a whole. Lights are often out, energy conscience. Aside from the language barrier, walking down the street you wouldn’t really know you were outside the US. Arriving in Cologne, we get off the train and find this standing in front of us! The ceiling of the Dom. Pretty cool. Got to Castle Eltz, we could barely find a parking spot. It pays to visit in the off season. Ended our German adventures with a traditional German meal. Sausages, sauerkraut, green cabbage and potatoes! Wow!! Great pics, so happy I get your updates 🙂 How much fun!! Enjoy! !